3/4" OD KEYED SHAFTING with a 3/16" x 3/32" full keyway. Sold by the inch. Quantity 1 = A 1" long piece of shaft. 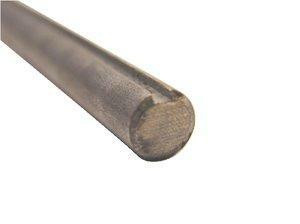 C1018 cold-drawn steel with a keyway cut down the entire length. Specify in the Quantity the number of inches you need. Use the Customer Comment text box to notify any specifications for example an 36" total but need it in two pieces, 18" long. Weight is 1.35 oz per inch. Max 6' Length shipped. Or contact us first.